JORDAN RODRIGUEZ rushed for over 160 yards and scored three touchdowns for Magnolia in a 30-17 win over Bolsa Grande Friday night (Orange County Tribune photos by Jim Tortolano). Coming off a disappointing 2017 campaign the Bolsa Grande Matadors were looking forward to starting off the new season with a bang. They took on the Sentinels of Magnolia High School on Friday night in the first game for both teams of the season. Both teams struggled last year but there could be only one winner to open the campaign. Bolsa fell to Magnolia in this one, 30-17. The Matadors feature a roster with a good mix of seniors and juniors along with a couple of sophomores mixed in there. Junior quarterback George Hernandez leads the team this season after having some playing time last year as a sophomore. Hernandez went 12-24 for 169 yards in the air and one touchdown pass. 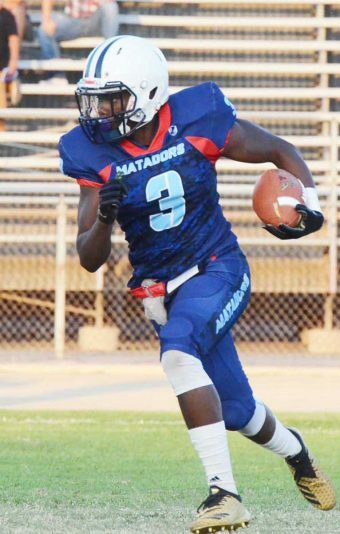 The Matadors started off hot with an 80-yard touchdown off the opening kick by Jaylen Todd. Todd is one of the key players on this team along with Hernandez. He added a beautiful over-the-shoulder grab for a touchdown in the second quarter. He finished with 140 receiving yards and over 200 yards of total offense including two touchdowns. He also threw a completion to Hernandez for 16 yards. 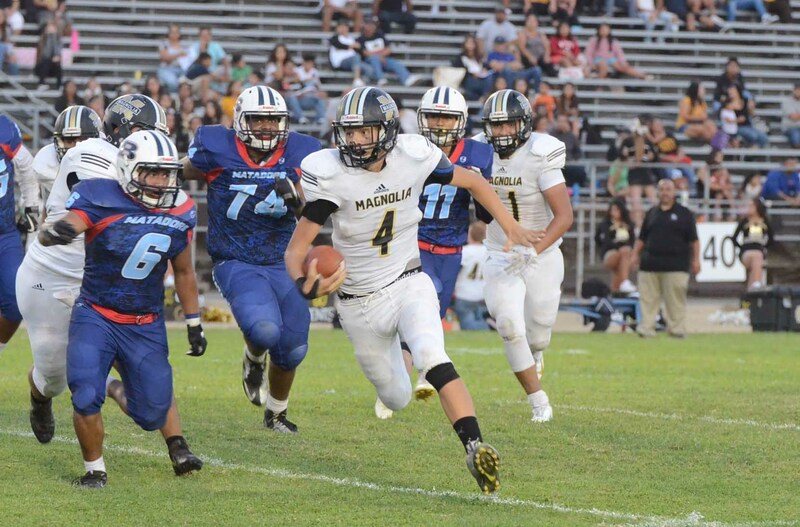 Magnolia was led by its 6-foot, 4-inch quarterback Jordan Rodriguez, a sophomore, who coach Desmond Hernandez is excited about. “He added about 15 pounds this offseason and is ready to take on this season.” Rodriguez went 8-for-16 passing for 98 yards and threw two interceptions. He led the Sentinels in rushing with over 160 yards and scored three touchdowns on the ground but also had three total turnovers including a fumble. JAYLEN TODD returned the opening kickoff 80 yards for a touchdown to give Bolsa Grande an early lead. The game started off with fireworks with Magnolia letting up an 80-yard return for a touchdown to start the game off. The Sentinels did answer back with a 70-yard drive capped off with a 3-yard touchdown run by Rodriguez. Magnolia took an early lead at 7-6 early in the first quarter. Tai Nguyen intercepted Rodriguez late in the first for the game’s first turnover. Bolsa made several mistakes on special teams throughout the game allowing a sack on a punt resulting in a 20-yard loss. On the next drive Ryan Lee took it in from 6 yards out to put the Sentinels up 14-6 at the end of the first quarter. Another error on special teams allowing a block punt on a bad snap resulted in the Sentinels having great field position to start the second quarter. However, Magnolia had some miscues on snapping as well with a bad snap to Rodriguez resulting in a turnover in the second quarter. With all the turnovers in the first half, Bolsa was only able to muster up eight points off those changes of possession. The next series saw a 23-yard touchdown reception by Todd bringing the score to 14-14. A 33-yard field goal by Max Rivera with less than 10 seconds put Magnolia up at the first half 17-14. Bolsa took a 23-yard field goal to tie the game up at 17-17 coming out of halftime. Shortly after that an interception by Bolsa on Hernandez gave the Matadors great field position early in the third. However, they gave the ball right back, going three-and-out and then fumbled the ball on the punt snap again. This was followed up by a 5-yard touchdown run by Rodriguez giving the Sentinels a 24-17 lead. After a turnover on downs to start the fourth quarter for Bolsa, Magnolia capped off a six-minute drive with a 13-yard rush by Hernandez, his third of the game, to make the score 30-17. The Matadors threw another interception late in the game to seal the victory for the Sentinels. Matador coach Alfredo Silva after the game commented on the loss. “We thought we had our special teams prepared and it turns out that we had one great play and we thought it was going to set the tone for the game but it didn’t,” he said. Bolsa Grande’s (0-1) next game is on the road against Bosco Tech next Friday, August 24 at 7 p.m. in Rosemead. 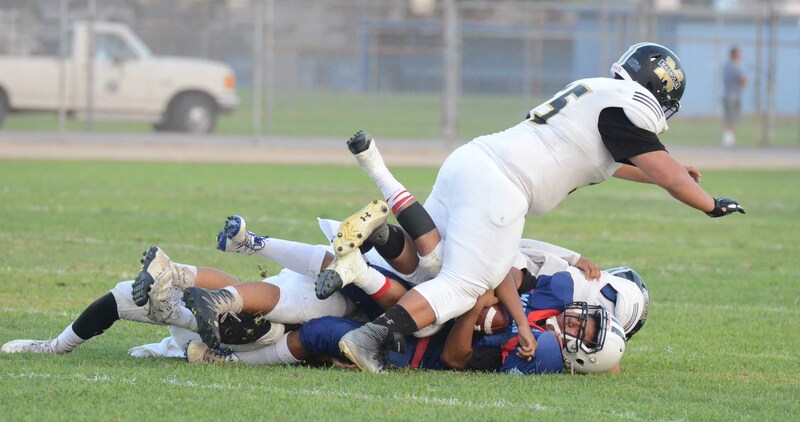 IT WAS A PHYSICAL GAME between Bolsa Grande and Magnolia Friday night in the season opener for both teams at Bolsa Grande Stadium. Sentinels won, 30-17.